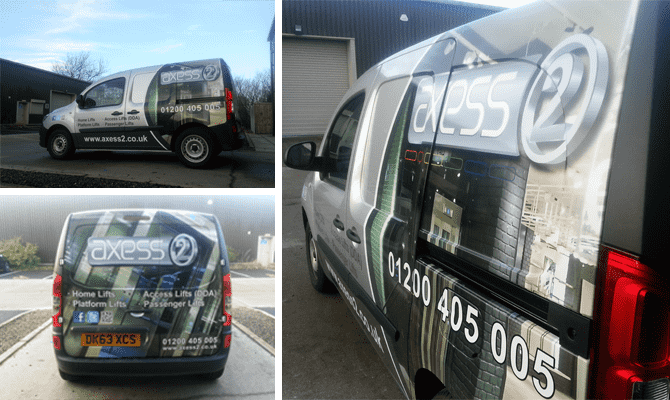 Axess 2 has launched new livery for its fleet of vehicles. The first vehicle in Axess 2’s fleet to carry the new brand identity that was created by Pendle Signs was unveiled at our head office in Lancashire. The new brand is an evolution of the tried and trusted brand of Axess 2 Ltd. The new livery is modern and distinctive and retains the core design structure of the previous identity. The first vehicle carrying the new brand identity hits the road this week. The new Mercedes Citan is a great new addition to Axess 2’s fleet and promotes our new logo, corporate colours and website. Marketing Manager Nathan Massey said “The new livery follows hot on the heels of our new brand identity and we’re keen to reinforce our new look and market presence on the road. We continue to invest in taking the business forward and we look forward to growing our customer base and providing exceptional customer service across all areas of the business”. At Axess2, we are a reliable family owned lift company that can lend our professional and affordable expertise to any commercial or domestic project seeking to procure a vertical or incline platform lift. Please call us on 01200 405 005 or contact us to find out more.